“Anthony Bourdain.” “Anthony Bourdain Osaka Bar.” “Anthony Bourdain Osaka Hanshin Tigers Bar.” “アンソニーボーディン大阪阪神タイガース居酒屋.” I Googled all these search terms, and no small number of variations on them, one afternoon in a coffee shop at Gimpo International Airport. Soon to catch a flight to Osaka, my favorite city in Japan, I’d just found out that Toracy, my baseball bar of choice there, had shut down since last I visited. Searching for another Tigers-supporting watering hole, I learned that no less exacting a foreign experience-seeker than Anthony Bourdain began an episode of his travel show No Reservations in one. Considerably rowdier than Toracy, from what I gathered, it somehow also turned out to be all but secret: all the Googling I could do before takeoff time produced no positive identification. Later that evening, having arrived in Osaka and needing directions to a restaurant, I turned on my phone to a notice that Bourdain had died. Sheer unexpectedness had made the death top-story notification material, but so had the high esteem in which the dead was widely held. As with the passing of every celebrity in the age of social media, seemingly all who could claim even the most tenuous connection with Bourdain stepped forward to tell their stories in tribute. Not only did I have no stories, I never even got to know the man’s body of work, apart from reading here and there in his books. I always meant to catch up on his writings and television programs, but never did. I found myself reminded of that intention whenever I heard Bourdain had traveled to and appreciated one of my own places of interest in the world. He first made it to Korea in 2006, on his Travel Channel show No Reservations. I didn’t see it then, but I’d been harboring slow-burning Korea-related interests of my own: the following year I fell into studying the Korean language, a pursuit that played a part in my move, a few years thereafter, to Los Angeles’s Koreatown. In the middle of my time there, Bourdain turned up and made the neighborhood the subject of an episode of Parts Unknown, his CNN successor to No Reservations. 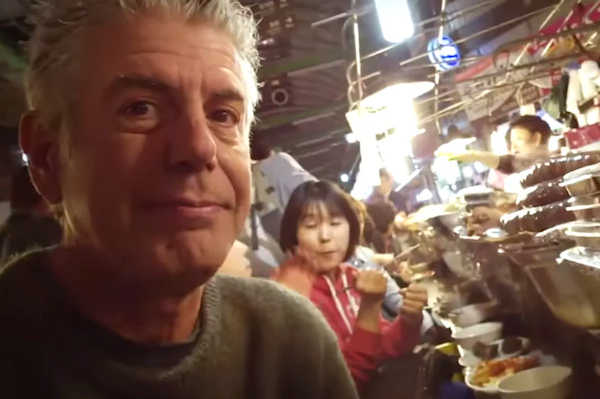 Just a few months before I relocated from Los Angeles to Seoul, Bourdain returned to Korea to give it the Parts Unknown treatment, a hard-drinking, hard-eating, backwards-told travelogue that surely qualifies as avant-garde by the standards of mainstream cable television. This was written by Colin Marshall. Posted on Sunday, June 24, 2018, at 4:15 pm. Filed under food, Korea Blog, Koreatown, Los Angeles, Seoul. Bookmark the permalink. Follow comments here with the RSS feed. Comments are closed, but you can leave a trackback.